We all hide secrets of some sort: secret crushes, secret fears, secret longings, but all secrets are not equal. Sixth-grader Grayson Sender, has already faced many challenges in his life: Both parents were killed in an automobile accident when he was four, so he now lives with his aunt, uncle, and two cousins. His only friend moved away several years earlier. Grayson travels a lonely orbit both at home and at school. His loneliness is an effect of his secret: Despite his male exterior, Grayson is certain that, inside, he’s a girl. What would it be like to be forced to inhabit the wrong body? To be unable, because of societal mores, to express one’s true self? Ami Polonsky poses these questions with delicacy and grace, as we see Grayson hide his glitter pens and gaze with envy at the purple leggings, lacy pink tops, and long flowing skirts worn by his female classmates. No one knows Grayson’s secret. Not even his Aunt Sally and Uncle Evan. Some, though, suspect that something is “wrong” with Grayson. His cousin Jack, just one year older and angry at the world, calls Grayson “loser,” and delights in trying to make Grayson feel like the outsider he has become. The one champion in Grayson’s life is his Humanities teacher, Mr. Finnegan, called “Finn” by his students (and “so gay” by Jack). Finn also directs the school plays. This year’s production is Persephone. In the play a young Persephone, granddaughter of Zeus, lives with her mother Demeter on Mount Olympus until she is kidnapped by Hades, god of the Underworld. Persephone’s greatest wish is to return home to her mother. Eventually, Zeus brokers a deal with Hades in which Persephone is allowed to spend half the year with her mother and half with Hades. Grayson decides to audition for the lead. He doesn’t tell anyone, giving him yet one more secret to hide from the world. His chances of success, being a sixth-grader and a boy, seem slim. The play offers a clear parallel to Grayson’s life in that he, too, wants to return to his mother, the one person who truly understood and accepted Grayson for who he was. The role would grant Grayson several other wishes: family members who would fight for him, the chance to inhabit a female body, and, not insignificantly, the opportunity to wear, legitimately, a long flowing gown. His inside self, he reflects, would finally match his outside self. And everyone would see him as he truly was. Not everyone in Grayon’s life wants to see this. Grayson’s Aunt Sally, afraid for his safety¾at least, that’s her stated reason¾goes to the school principal, demanding action. Polansky does a good job of balancing her cast. Grayson’s fellow thespians, especially the girls, embrace Grayson in his role. Grayson’s male classmates are less embracing. Some adults, both male and female, understand the struggle they see raging within this young boy and reach out to him. Some do not. Or will not. 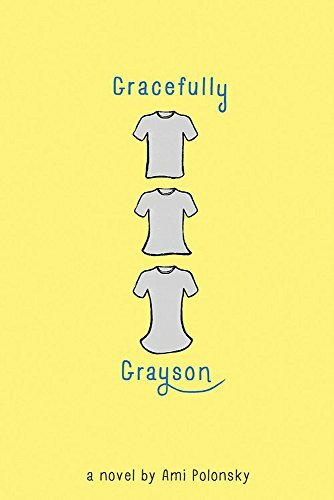 In a world where students are bullied to the point of suicide for being far less different that Grayson, some readers might anticipate a rougher road for Grayson, and a less satisfying outcome. In Gracefully Grayson, Polansky’s debut novel, she imagines and creates a better world¾not a perfect one¾but one in which change is possible and the heroine gets to return home, even if only for part of the time.